It is an emergency if you have a gas leak! Call us now. Has your gas been turned off by Con Edison or National Grid? Do have a gas leak? Call Rite Plumbing & Heating in NYC at 347-502-6441 24-hours a day for prompt emergency service assistance. We are insured and licensed plumbing/heating company offering emergency gas leak detection service and Gas Stove Installations in the New York City and surrounding areas. Do plumbers fix gas leaks? Yes! We handle emergencies 24/7 and are New York City’s top choice. If you have a gas leak, take your family and pets outside and call us right away for an emergency expert gas leak plumber in NYC – including Queens, Brooklyn and Manhattan. We are prompt and efficient when servicing and addressing gas leaks. #1 – Do not attempt to install gas stoves, gas stove hoses, gas piping or a gas cooktop on your own. Leave it to a professional like Rite Plumbing & Heating. #2 – Do not attempt to fix a gas leak. Gas leaks are typically due to something in your home that is not managing the flow of gas correctly. It could be coming out of a faulty appliance or pilot light from your gas logs that only a professional can handle. If you do not call a plumber, a gas leak can lead to a fire or even an explosion. It is crucial to get out of your house immediately and call us now if you think have a gas leak. You should never try and fix a gas leak yourself. Pay attention to the tell-tale signs of a gas leak. It can save your life. Carbon Monoxide Gas Leaks is nothing to play around with but can be one of the more difficult challenges of gas detection.The signs of carbon monoxide poisoning are dizziness, nausea, and lightheadedness. These symptoms go away when breathing fresh air. We have the tools. Rite Plumbing & Heating right away to take care of this for you. Crisp blue flames are normal, orange, or yellow flames are not; A pilot light that blows out easily is not normal; Lookout for black or brown soot around your appliances; beware of condensation on your windows; If you smell musty air, there may be a gas leak. Call Rite Plumbing & Heating to check your for appliance for gas leaks. We offer emergency assistance, assessments, and gas stove installations. Do you have a gas leak? Even if you are not sure, get out of your house and call Rite Plumbing & Heating immediately. 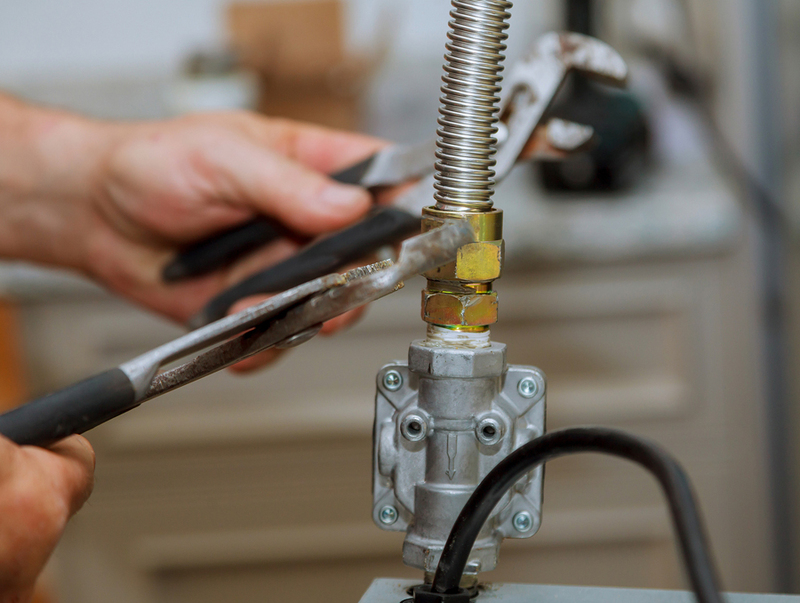 Never try to install a gas stove or gas stove hose or gas stove cooktop without calling a Rite Plumbing & Heating professional. Do not attempt to install gas piping of any kind. Properly securing gas line connections with the appropriate fittings is crucial. We have the tools to do this. Rite Plumbing & Heating specialists are certified to handle gas piping leaks or pipe installations. Has your gas been shut off by Con Edison or National Grid? This is a common problem for New York City tenants due to old, decrepit piping. When Con Edison or National Grid turns your gas off, call pro’s you can trust at Rite Plumbing & Heating. All it takes is the landlord or property owner to reach out to a Rite Plumbing & Heating to come and perform an inspection to ensure the problem has been fixed. We know how to communicate with building management and staff on situations like this. Call us now! New York. We provide a COI (certificate of insurance) and handle big or small residences and businesses, including Co-Op and Condominiums. It is crucial you choose the right professional plumbing service. We are available 24/7, contact us now! 24/7 Gas Leak Repair Service in QUEENS, BROOKLYN, AND MANHATTAN. Schedule a gas leak specialist through our online calendar.